Defining artistic style is one of the key elements of art historical inquiry, although the analysis of artworks solely in terms of style no longer dominates the field the way it once did. Art historians speak of several different kinds of artistic styles. Period style refers to the characteristic artistic manner of a specific time, usually within a distinct culture, such as “Archaic Greek.” But many periods do not display any stylistic unity at all. How would someone define the artistic style of the second decade of the new millennium in North America? Far too many crosscurrents exist in contemporary art for anyone to describe a period style of the early 21st century— even in a single city such as New York. Regional style is the term art historians use to describe variations in style tied to geography. Like an object’s date, its provenance, or place of origin, can significantly determine its character. Very often two artworks from the same place made centuries apart are more similar than contemporaneous works from two different regions. To cite one example, usually only an expert can distinguish between an Egyptian statue carved in 2500 bce and one made in 500 bce. But no one would mistake an Egyptian statue of 500 bce for one of the same date made in Greece or Mexico. 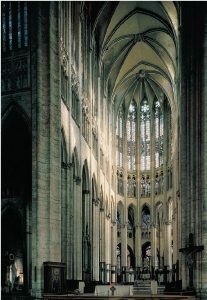 of the east end of Beauvais Cathedral began in 1284.
characteristic of this era, yet the two churches differ strikingly. 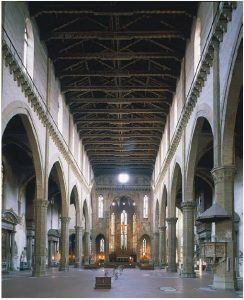 The French church has towering stone ceilings and large expanses of colored-glass windows, whereas the Italian building has a low timber roof and small, widely separated windows. Because the two contemporaneous churches served similar purposes, regional style mainly explains their differing appearance. 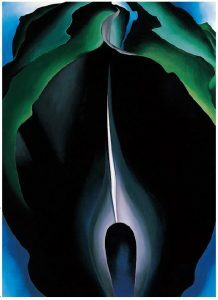 Stieglitz Collection, bequest of Georgia O’Keeffe). 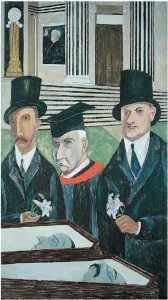 ben Shahn, The Passion of Sacco and Vanzetti, 1931–1932. The different kinds of artistic styles are not mutually exclusive. For example, an artist’s personal style may change dramatically during a long career. Art historians then must distinguish among the different period styles of a particular artist, such as the “Blue Period” and the “Cubist Period” of the prolific 20th-century artist Pablo Picasso.